Now we have two (at least) green and gold frogs in the sunken bath tub. Although both are a similar size neither is the bright green of a mature frog, so we’re assuming they’ve still a bit of growing up to do. One of them especially was quite timid to begin with when it saw us approaching, hopping off the rim into the safety of the water, but they both now seem to have realised we pose no threat, and are content to sit and bask while watching us, the chooks, the garden, and Della the dog until the heat becomes too much for them. A bit of research has also shown the bath tub could well be a nursery to more green and golds than just these two since it’s a species that takes longer than some to develop from tadpole to frog. Green and golds can stick around the bottom of ponds, dams – or our bath tub – for around 12 months while they slowly mature, so we could well have a few more lurking at the bottom and not quite ready to face the world. 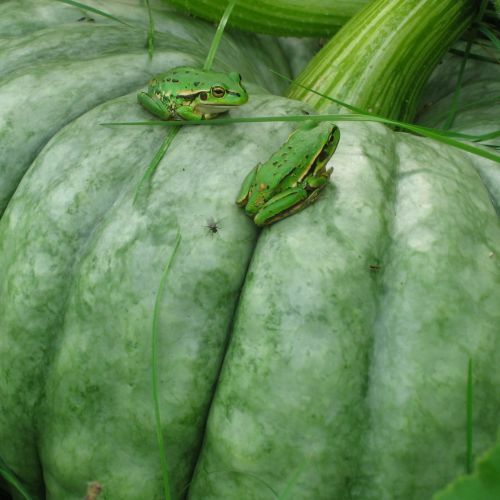 Time will tell, but hoping these two will decide to stick around while they grow into the bright green of a fully mature frog, and maybe pass the time of day on a pumpkin or two, like these two in the photograph.